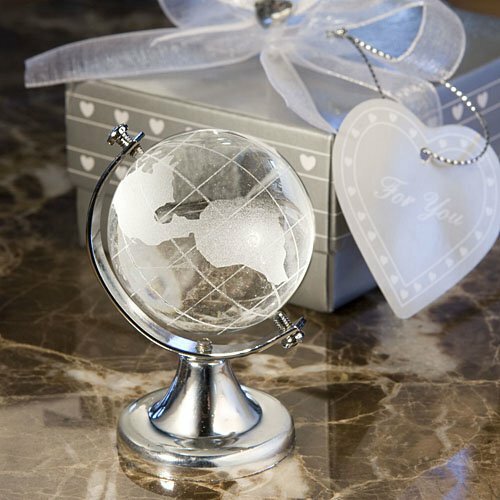 Show your guests that they mean the world to you with our stunning crystal globes etched with the world's design. They measure 2 3/4" x 1 3/4" and gently revolve on a silver axis and base. Each of these travel themed wedding favors are packaged in a white satin lined silver heart design box wrapped with an organza and satin bow with a matching heart shaped "For You" tag. Hi I like this globe favors does it comes with a personal message? I'm sorry but the Crystal Globe Travel Themed Wedding Favor do not have an option to add a personal message. This only includes a tag that will say "For You"
Can this item be engraved? I'm sorry, we do not have engraving option available for this item. Can these crystal globes be shipped to California? I'm sorry we're not able to ship this Crystal Globe Travel Themed Wedding Favor to California. This is due to "California Proposition 65". We have to comply with the regulation, which now is being enforced for any company shipping to California. Hi, I am curious to know if I would be able to order any of these items individually so that I might get a better idea of my favorite items. Of course I am willing to pay, I just dont want to order a lot of anything until I know exactly what I want. Yes, you can order a sample of the Crystal Globe Travel Themed Wedding Favor. Just enter 1 in the qty box then add to cart and complete the check out. Do you know what the exact size of the box? The Crystal Globe Travel Themed Wedding Favor measures 2 3/4" x 1 3/4".